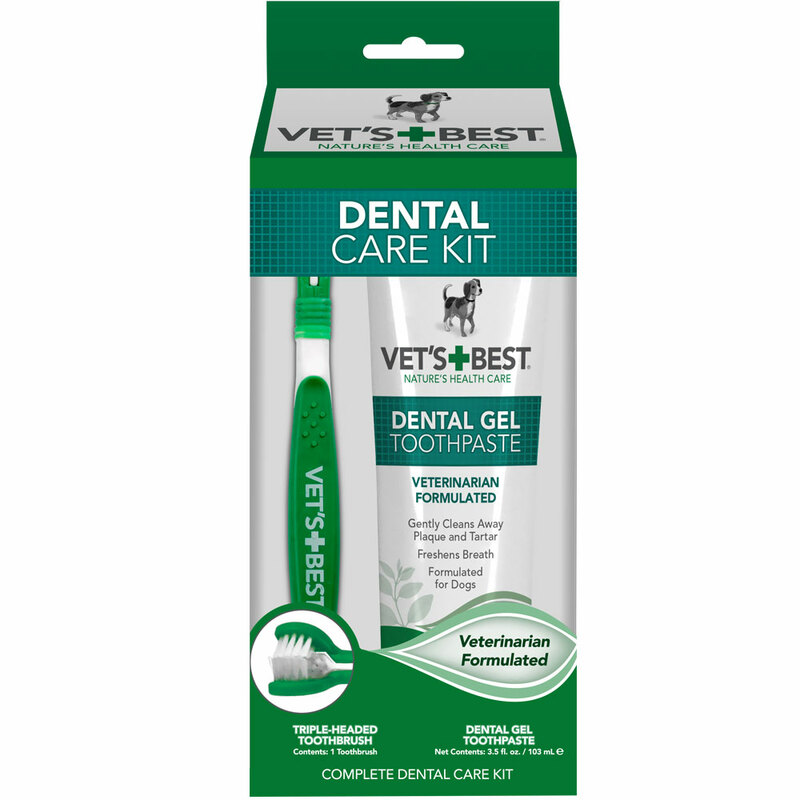 Vet's Best Dental Care Kit includes a tube of Vet's Best Dental Gel Toothpaste and a Triple-Headed Toothbrush for optimal dental care for your dog. The toothpaste is specially formulated with a blend of natural and effective ingredients incuding enzymes, neem oil, grapefruit seed extract, baking soda and aloe to help gently clean plaque and tartar while freshening breath! The toothbrush is designed with three bristle heads to conveniently clean around each tooth from every angle. Freshens breath with a great taste dog's love! Glycerin, Aloe, Pectin, Neem Oil, Grapefruit Seed Extract, Baking Soda (Sodium Bicarbonate), Glucose, Oxidase (Enzymes) and Natural Flavors. A. Brush Application: For best results, use your Vet's Best Toothbrush to effectively clean away plaque and tartar build-up. For your first time, apply a drop of gel to your finger and allow your dog to taste. Apply a small amount of gel toothpaste to the toothbrush and gently brush your dog's front teeth slowly working up to the inside and back. Encase each tooth between the three sets of angled toothbrush bristles. Brush using a back and forth motion making sure to reach evey tooth from all angles. Give lots of praise! For best results brush your dog's teeth several times a week. Vet's Best Dental Gel Toothpaste is safe to swallow; no rinsing is necessary. Always provide your pet with fresh, clean water. B. Finger Application: Apply to your finger for direct application to your dog's teeth for added cleaning control. C. Breath Control Application: Apply a dab of toothpaste directly to your dog's tongue to instantly freshen breath.